I was simultaneously intrigued and panicky when Darlene from Blazing Hot Wok announced the theme for the latest Regional Recipe Roundup. Scandinavian cuisine is something that I knew very little, nothing about, so coming up with something to submit would involve hours of research I initially thought. But then I remembered some lovely meatballs I encountered at a International Food Evening while still at varsity a few years back and the memory brought a smile to my taste buds. Because those meatballs were gooooood. Despite my weirdness regarding berries in a mushy state (I won't even try to explain). 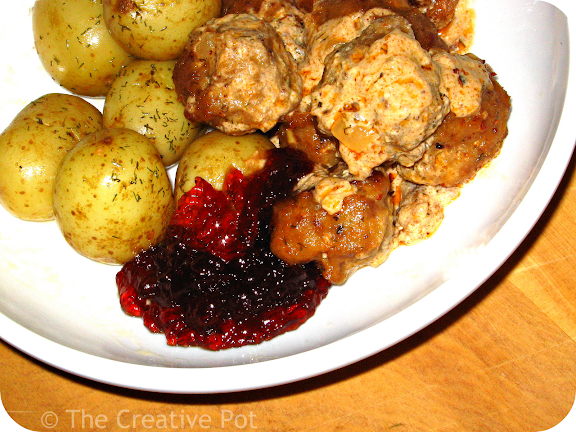 Because the cranberry preserves complemented the tender meatballs in a creamy sauce perfectly. And who can argue with such a sublime combo? Making these were super easy and the end result was just as good as I remembered. Perhaps even better, as I can now rest safe in the knowledge that I won't have to wait for another International Food Evening to taste these babies again. Come to Mama! I'm submitting this to the Regional Recipe Round-up for October, hosted by Eats Well With Others and originally created by Blazing Hot Wok. 2. Heat butter in a small saucepan and saute onion over medium heat until soft (a few minutes). 3. Mix ground meat in a large bowl with the rest of the ingredients for the meatballs (including the onions). Form into small balls and place on a baking tray (no nead to grease the tray). Bake in the oven for 25 minutes, or until nicely browned. 4. Meanwhile, make the sauce: Heat butter over medium heat in a small saucepan. Add garlic and tomato paste, cook for a minute, then add stock and simmer until slightly thickened and reduced. Add sourcream and stir nutmeg and dill through. 5. When meatballs are done, transfer to an ovenproof dish, pour sauce over and return to oven for another 15 - 20 minutes. Sauce will have thickened substantially. 6. Serve warm with boiled baby potatoes tossed in butter and a dollop of cranberry jelly. I love your meatballs! They sounds delicious! Thanks Karine, they really are! This reminds me of my childhood. Swedish meatballs were my favorite meal when I was a kid. Whenever my mother asked what I wanted for dinner the answer was always Swedish meatballs! Great post. Amber, I think these are going to become my new favourite way to eat meatballs as well! this is almost like meatball Stroganoff , looks really yummy.